I am pleased, because my second skein of the Chroma wool cooperated with being turned into a cake. I love the watermelon-y feel to it, and after a bit of looking around, i found a pattern that looks interesting. 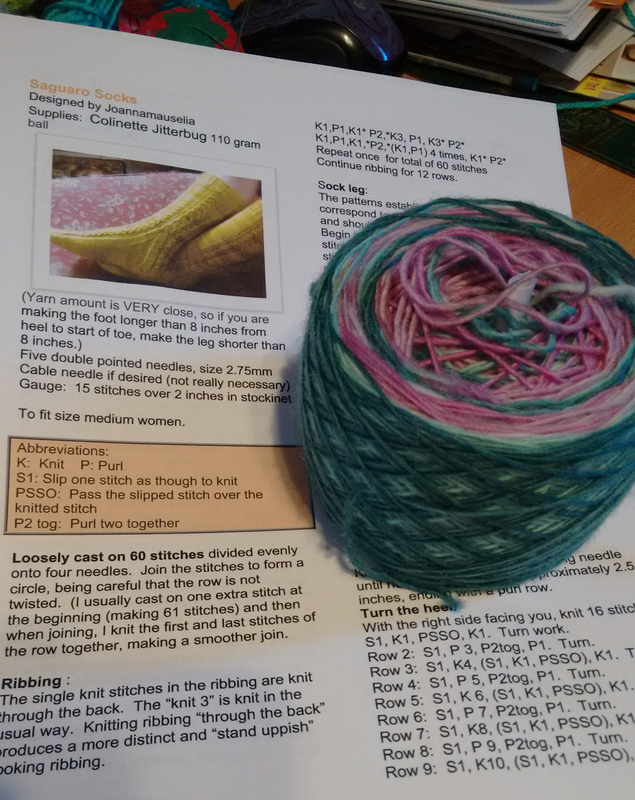 I’m pretty sure that the skein should go the distance, but if not, I might do the toes in the remnants of the other skein of Chroma, different colourway be damned! Really though, I just wanted to make sure I had a ‘proper’ project ready for tomorrow night. I could probably work on the toy mice, and I might very well take those along as well, but it might be a bit fiddly to do while socialising. Or it might not be. I guess I have to admit that I went from the knitter who swore that she’d only do one project at a time to someone who has a couple of things on the go — like everyone else, ha ha. Still, at least I’m doing a fairly decent job of keeping it to one ‘big’ project, and one or two small/junk projects. Beyond that, just sort of mulling and watching the world go by. I’m curious as to what will happen to the UK when it comes to Brexit after the election. I wonder if May is going to cling on to power until she is forced out. Really, there’s a lot of hurry up and wait going on, so what else can I do? I do feel better after last week’s election, but it’s still not the start or end of anything exactly.